In general, most perennials prefer being planted in sites with well drained soil. The drainage in poor soils can be improved by adding organic matter like, compost, leaves, peat moss, or aged manure. For new perennial beds, incorporate 4 to 6 inches of organic matter into the soil before planting. When transplanting new perennials into an existing garden, incorporate a few handfuls of organic materials into the hole prior to planting. In general, dig a planting hole at least 50% larger then the size of the container you are planting. Larger sized holes should be dug when you intend to mix in organic material. Carefully remove the perennial from the container by holding one hand over the top of the pot and turn the container upside down. Gently tap the bottom of the pot to loosen the root zone from the container and gently pull the pot away. If the container does not easily come off, it may be necessary to squeeze the container until the plant comes out of the pot. Next, place the plant in the hole so the top of root ball is at the same level as the top of the hole. It may be necessary to remove the plant and place a little soil back in the bottom of the planting hole and retry aligning the top of the hole with the top of the root ball. Many perennials do not tolerate being planted too deeply and may not grow very well or may succumb to crown and root rots. Conversely, perennials planted too high may not grow properly and are more susceptible to drying out. Once the plants are at the proper height, fill in the planting hole with soil, gently packing the soil around the roots and being careful to not overly pack or compact the soil around the new planting. After planting, it is important to water them well. For the first couple of weeks or so, it is important to keep the soil moist, but not soaking wet. Keep in mind that many new plantings do not perform well or even die because they are either over- or under-watered. Once they are established, most perennials can tolerate less moisture. For optimum growth, it is recommended to deliver 1 inch of water per week either by rainfall or through irrigation systems. Description: With its aromatic, bright, and showy long-lasting flower clusters Phlox paniculata has become a staple in today’s landscapes. Garden phlox is one of the most recognizable and widely grown perennials. Recent breeding efforts have brought several improvements to this already popular species of perennial plants including a wide range of flower colors available, improved plant habit, and increased resistance to diseases. 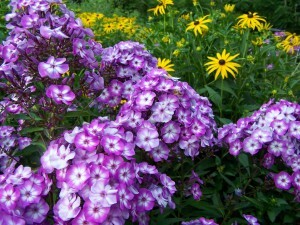 Garden phlox is the backbone of the summer perennial border and is also a great perennial for open sunny locations. The striking and fragrant trumpet-shaped flower clusters appear in the mid-summer and always deliver a spectacular display of color when they are blooming. Today’s cultivars produce a wide range of flower colorations consisting of various hues of lavender, orange, pink, purple, red, salmon, scarlet, and white. Many cultivars have contrasting colored eyes or bicolor blooms. Maintenance: Phlox are easy to grow and only require few maintenance activities. It is recommended to remove the flower heads when they are done flowering. Taller cultivars may need additional support from cages or staking to prevent the flower clusters from lodging. To reduce the occurrence of powdery mildew, thin or divide large clumps every year or two to improve the air circulation around the plants. Pests and Diseases: Some of the most common insect pests that may be observed feeding on Phlox include aphids, beetles, caterpillars, grasshoppers, leafhoppers, leafminers, and spider mites, whiteflies. Most of these pests, under normal circumstances, do not cause significant injury to garden Phlox. Garden phlox are susceptible to several pathogens including fungal leaf spots, powdery mildew, and stem canker diseases. Of these diseases, powdery mildew is observed most frequently. There are great differences between cultivars in their susceptibility to powdery mildew. Even highly resistant cultivars may succumb to this disease under severe or optimal conditions for disease development. This occurrence of this disease can be reduced when the plants are planted in areas with good air circulation, the plants are not crowded, and by avoiding overhead irrigation (wet foliage). Uses in the Garden: Garden Phlox are commonly used as accent or aromatic border plants. They are also resistant to deer. Other Uses and Attributes: This Native American perennial attracts butterflies and hummingbirds into the garden. Phlox makes and excellent cut flower and offers an excellent vase life. Many of the smaller cultivars make nice container or patio pots. Description: With its ease of growth, variety of plant shapes and sizes available, and diversity of leaf colorations, Hosta is one of the most desirable perennials for gardens with partial to full shade. In the landscape, the foliage can provide a bold presence while softening the appearance of well defined areas. Hosta forms attractive mounds of basal foliage. The shape of the leaves ranges from narrow elliptic to very broad ovate or heart shaped. The leaf texture may be shiny, smooth, or puckered and consists of numerous colorations of yellow, white, and greens to blue-green with and without distinct veining or variegation. They produce lily-like, bell-shaped, white, lilac, or blue colored flowers on stalks that rise above the foliage in the mid summer. Many cultivars produce fragrant flowers which are great for attracting hummingbirds into the garden. There are literally hundreds of cultivars, hybrids, and species to choose from. Hostas are most commonly referred by only their cultivar names as the parentage is often unclear. With the diversity of leaf colorations, plant habits, flowering characteristics and ease of growth, Hostas will likely remain one of the most popular perennials of the 21st century. 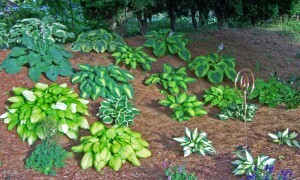 Preferred Conditions: Hosta prefers to be planted in locations with a fertile, moist, well-drained soil. However, they are tolerant of a wide range of soil conditions. Most Hosta cultivars will grow more vigorously and have the best leaf coloration when they are planted in locations with partial shade, particularly in the afternoon. Many cultivars, especially variegated ones, will show signs of marginal leaf burn when grown in full afternoon sun. In general, gold- or yellow leafed cultivars can tolerate more sun, while blue-leafed or cultivars with lots of white variegation require more shady conditions. Planting & Maintenance: Containerized Hosta can be planted throughout the growing season, but are most commonly planted in the spring or the fall. They should be planted even with or just slightly higher then the soil line. Generally considered easy to grow and require little routine maintenance. To maintain a clean and attractive appearance, many gardeners remove the flower stalks once the blossoms have faded. Mulching during the summer months will help keep the soil moist and reduce leaf scald on plants in sunnier locations. The foliage should be cut back at the end of the growing season. They can be divided every 3 to 4 years if the clumps become too large. Pests and Diseases: Generally, they can be grown without many insect or disease problems. Aphids, crown rots, leaf spots, slugs, and spider mites may occasionally become problematic. Of these pests, slugs will likely be the most prevalent and may require removing them by hand, trapping, or using baits to keep them from severely damaging the foliage. Some cultivars may get leaf scorch when they are planted in hot, full sun. Uses in the Garden: Hosta are commonly used as accent or specimen plants, in woodland gardens or rock gardens, in borders, and as edging plants, groundcovers or mass plantings. Other Uses and Attributes: They are commonly used in patio pots or smaller cultivars can be utilized as components in mixed containers. The flower spikes make fine additions to cut flower arrangements. When blooming they attract hummingbirds into the garden. These tough plants are also resistant to rabbit feeding.